Pancrazio Jacovetti da Calvi was documented in 1467 as “pictor” (painter) in his native town, some 20 km south of Narni. Subsequent records show him as an active citizen of the town. His only securely attributed works are the signed frescoes in San Biagio, Corchiano, which were probably painted soon after the church was rebuilt in 1466. These reveal him to have been a follower of Antoniazzo Romano. He probably died before 1513, the year in which his three sons sold some land that had belonged to the family. A surviving document records that the Priors of Narni paid Pancrazio Jacovetti da Calvi for three images (presumably frescoes) of the arms of Pope Sixtus IV in 1472. 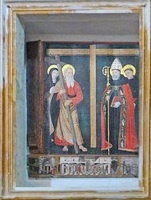 This fresco of the Madonna and Child with SS Andrew and Augustine in a niche on the external facade of Sant’ Agostino is attributed to Pancrazio Jacovetti da Calvi. ✴SS Augustine and Nicholas of Tolentino, on the right. The panel apparently originally formed the backdrop for a Crucifix (15th century) that is now in San Giovenale, which is illustrated here. The cross and plain background of the panel were painted in at an unknown time over the original landscape setting. ✴the Mass of St Augustine. This panel on the altar of the Cappella della Consolazione, San Giovenale, which is a copy of the icon in Santa Maria del Popolo, Rome, is attributed to Pancrazio Jacovetti da Calvi. Rinaldo da Calvi, the son of Pancrazio, was documented in 1497 as “magister” (master) in Calvi. He trained in his father’s workshop, which he probably continued after his father’s death. His only known, signed work is a documented altarpiece (1521) of the Coronation of the Virgin in San Nicolò, Stroncone. His documented frescoes (1525) in the church of Sant’ Antonio Abate, Civita Castellana also survive. A document in Calvi dated 1528 refers to him as deceased. In 1514, Bishop Pietro Gormaz commissioned from Rinaldo the decoration and gilding of the Cappella della Consolazione in San Giovenale. Most of this work has been lost. In 1522, the Priors asked him to value an unspecified work by Lorenzo Torresani. In 1523, he received a commission from Cardolo dei Cardoli, the Prior of the Società delle Suore del Rosario, for a now-lost altarpiece of the Assumption of the Virgin, surrounded by scenes of the mystery of the Rosary, for Santa Maria Maggiore (now San Domenico).